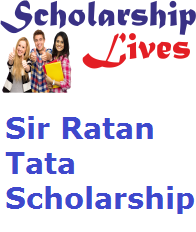 The department of the Sir Ratan Tata Trust will soon activate the Sir Ratan Tata Scholarship 2019 Online Application form for all students pursuing undergraduate and postgraduate degree level in the field of architecture, catering & hotel management, fine arts, LLB, Education, and LLM. The main objective of this scholarship scheme is to support the students to make a bright future without any financial aid. The team of the trust will select the candidates on the basis of the merit list and distribute scholarship money Rs. 6,00,000/- (Six Lakhs) each, payable in two equal installments in the first year and second year correspondingly. The main point is this scholarship cover the tuition fee only to applicants who are studying in India at the undergraduate or postgraduate level. Hostel and other fee are not covered under the scholarship. The expected cut-off percentage for both UG and PG student is 70%. The student is receiving earnings.
. No forms will be issued to students studying diploma, part-time, correspondence or certificate courses. Applications form for this Scholarship is available in the upcoming days and also sent through email will not be considered.